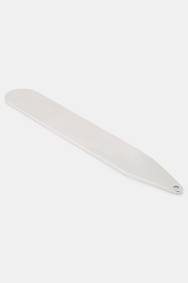 These Moss 1851 silver metal collar stiffeners are great to keep your shirts looking smart for longer. 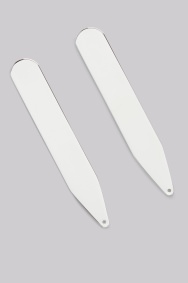 Heavyweight collar stiffeners that fit perfectly. I wish I had bought these years ago. Looked good quality. Haven't used it yet. Products I have bought at your shop have always been good quality and reasonably priced. I didn't know that collar stiffeners were available in metal! Very good, better than the usual stiffeners which have broken on more than one occasion. Of better quality than expected and well presented,only missing correct box for complete perfection.